Iran said Monday it rejected a US request for its cooperation against the jihadist Islamic State as part of an international coalition whose true aim Tehran sees as regime change in Syria. Seen from Tehran, which has helped both Damascus and Baghdad to confront IS advances, the coalition lacks credibility because some of its members had financed and armed the group as part of their campaign to bring down Syrian President Bashar al-Assad. "Right from the start, the United States asked through its ambassador in Iraq whether we could cooperate against Daaesh," Iran's supreme leader Ali Khamenei said in a statement on his official website, using the Arabic acronym for IS. He accused Washington of seeking a "pretext to do in Iraq and Syria what it already does in Pakistan -- bomb anywhere without authorisation." At the end of a Paris conference on coordinating the fight against IS, to which Iran and Syria were not invited, the United States said Monday it was opposed to military cooperation with Iran in Iraq but was open to further talks. COMMENTARY: More detailed aspects of Iran's current view of the U.S.-led war against ISIL are not hard to deduce. American strategists are seeking a maximalist regional political yield from the crisis generated by ISIL. By the fact that the might of American tactical airpower and logistical support are indispensable in the war against ISIL (Iraqi theater), the opportunity has arisen where a number of foreign policy goals in the region are now seen-- from the American perspective-- to be within reach. One such goal has been the establishment of American preferences in the composition of the Iraqi government-- that's now achieved. Another goal is regime change in Syria-- and in so doing attain the realize yet another goal, the rollback of Iranian influence in the region. This is the root cause for the apparent anger in Khamenei's tone. Although Khamenei referenced Pakistan for the relative free hand of American airpower, it's easy to see that Iranian strategists are concerned with another type of intervention: overwhelming application of tactical airpower, as was the recent case of NATO intervention in Libya that successfully resulted in regime change. This time, the Iranians are seen to believe the intervention will be U.S.-led and applied to Syria. Of immediate concern for Tehran may be the potentialial severing of the logistical air corridor between Iran and Syria (and by extension, Lebanon), which is an incremental step toward the realization of American goal of regime change in Syria and the rollback of Iran in the region. The attainment of American political preferences in the composition of the Iraqi government certainly makes this step a possibility. The Iranians are not going to sit still. While they possess significant political and militia levers inside Iraq, Syria on the other hand-- weakened by years of conflict and by its relative remoteness to Iran--appears potentially more vulnerable, under conditions of direct American military intervention. The public also voted for Rouhani as [resident, who specifically ran on expanding relations with the U.S. and the West, and won handily over the candidate of the extreme right, preferred by Khamenei. The take away is that what Khamenei says is not necessarily what the Iranians, and even all members of his own government, believe; and his views are not necessarily in the national interest of the country. On relations with the U.S., after he so publicly admitted today that he had vetoed holding meeting with the Americans against the views of some officials, now owns that decision, and will be directly responsible for it. He didn't like to be put in that position, his preference has always been the deniability if any particular decision goes wrong; and this is probably one of the reasons for his anger today. He also surprisingly said things that were not true, when he said the U.S. was not involved in the fight against ISIL in Iraq. I don’t know how to understand or explain this. It is worrisome when the supreme leader of a country is so detached from the realities, and I say this sincerely, not polemical. I hope peace comes to Syria and Iraq soon, as it is not in their interests, nor in the interest of Iran, to have the war against ISIL be prolonged. And let’s hope it would not be necessary for the U.S. to get involved in Syria either. In your opinion, do you believe that iran also has a lever to pull with the shia militias in iraq, should the u.s. seek a regime change in syria? U.s. has already ruled out boots on the ground and no other country has committed to ground troops other than a few hundred trainers and special ops. So the cooperation of the shia militia is key in deterrent for the u.s. from seeking a regime change in Syria. ROUHANI never said that HE wished to restore ties with the US specifically during his campaigns.. The masses did not the conservatives simply because of opposition to restoring ties !.You are putting your words in the mouth of the Presidents or you have your own campaign manifesto !. You say the Leader is detached from realities? -nay it is you Nader!.The US will turn Iraq and Syria into another Pakistan -kill at will , ambush at will.This is what the Leader is saying. there is many logical points the Leader makes in his words that YOU skip when going through his speeches. 1. Rouhani did run on expanding relations with the West, including the U.S. The discussion here is not on formal diplomatic relations. 3. The comments were made regarding Khamenei's pronouncement during his post-hospital interview that the U.S. is not involved in attacks on ISIL in Iraq. He also said reports on U.S. attacks on ISIL were "lies" and laughable. If that is not detachment from reality, what is? And coming from the supreme leader of an important country, that's scary. You probably have not read Khamenei's comments. They were not delivered during a speech, but during an interview with the reporter from the state-TV. I have translated all parts of the speech that deal with Iran-U.S. relations and U.S. in general. Which parts are you saying that was not translated here? Read the interview first, and then post your comments, it might help you to be a bit more accurate. In summary, Khamenei, during the interview, closed doors on any cooperation, or even meetings, with the U.S. on ISIL, and said that in his own government there were opposite views on that subject. He also denied reports of any U.S. attacks on ISIL in Iraq. Now tell up what you think about what Khamenei said. Don't attack me for reporting it, talk about the content of Khameni's comments in the interview. Nader, Iran's political system is more dynamic than most observers here give it credit. There was certain amount of discussion in Iran of coordinating with the U.S. in the fight against ISIL However since then it has become apparent that we Americans are pursuing a multi-track approach towards our renewed military commitment in the Middle East, which includes greater efforts toward regime change in Syria and the rollback of Iranian influence in the region. Khemenei's recent remark are a form of chastising those among the political elite, that were open to such a coordination. As for Khamenei stating Iran is not involved militarily in Iraq (or Syria), I think it possible the Iranians are referring to actual military formations fighting as an expeditionary force. Prior to 1965, we Americans offered a similar line in our commitment to RVN. 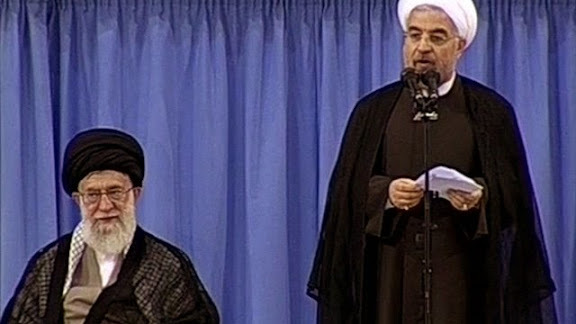 Khamenei was not talking about Iran's involvement, or lack of, in Iraq. He was saying the U.S. never attacked ISIL forces in Iraq. And he called reports of U.S. attacking ISIL position "lies." That's what's been discussed here, and that's what's scary. How detached can a leader get from the realities? Oh you refer to the war which was started by the terrorist group Hizballah... if they were so successful in 2006 then why haven't they militarily reacted to any Israeli defensive operation ever since? ... you are refering to the battle of Najaf in which the Iraqi/Iranian Mahdi army got completly smashed by the US, search for pics! Their losses were extremly heavy! Muqtada Al Sadr was hiding in the holy grand mosque in Najaf wailing loudly and crying his eyes out while his the corpses of his poor Iranian/Iraqi fighters were stacked in droves inside and all around the mosque! They were soundly defeated and consequently forced to leave their own home turf, the Shia dominated city of Najaf!